When word gets out about a place that has nearly 100 beers and the best burgers in an area with a lot of burger places, ears do tend to perk up more than just a little bit. And ours certainly perked up when we first heard about such a place in a relatively obscure section of Providence, less than an hour south of the Boston area. One reason for such interest in this watering hole (which is called The Abbey, by the way) is the fact that Boston doesn't have too many spots that feature an endless variety of burgers and beers, especially at reasonable prices. It is for this reason that this hidden gem near the North Providence line is one that is certainly worth the ride from the city. And if you live in Providence and love burgers? Well, you're just plain lucky. 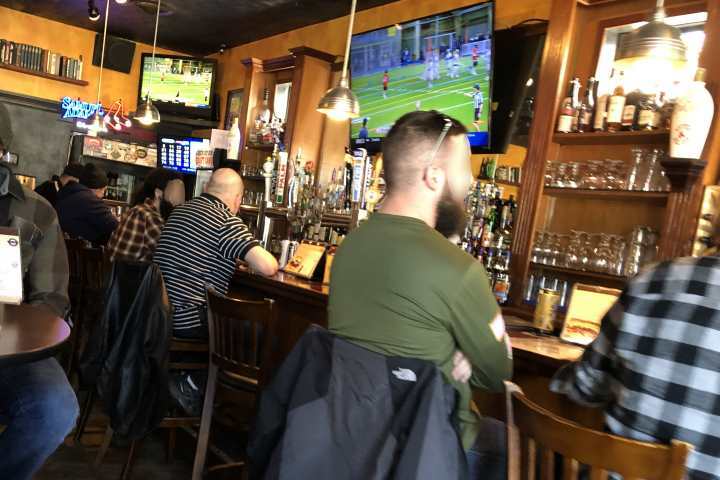 Located in a fairly quiet, mostly residential section of the Elmhurst neighborhood, The Abbey is probably not a spot that you would find in your travels of the city, since it is pretty far away from such bustling areas as College Hill and downtown Providence. Indeed, unless you go to Providence College (just south of the restaurant) or live in Elmhurst or North Providence, you might not have ever heard of The Abbey at all. From the outside, the place looks a bit like a roadhouse, residing in a well-worn structure that has neon signs in the windows. And the inside continues that juke joint vibe, with dim lighting, an old wooden floor, memorabilia on the walls, Led Zeppelin and the Rolling Stones booming through the speakers (the place can get very loud), and the smell of beer and cooked meat permeating throughout. Those unfamiliar with the place might think that this is a potentially rough spot that should be avoided, but there is little danger to be found here and the clientele is actually quite diverse, with college students, blue-collar folks, retirees, suburbanites, and young couples all sharing the single room and tiny bar area. The Abbey is a dream come true for folks who enjoy a burger and a beer, as there are so many options among each. Sure, the menu also features soups, salads, (non-burger) sandwiches, pizza, and even such entrees as jambalaya, but it really is all about the burgers (and beers) at this place. The Abbey does seem to take its burgers seriously, with TWO menu areas dedicated to flame-grilled hand-pressed patties, and if you can believe this, each burger (as well as other menu items) is "paired" with a particular beer on the menu, just in case you aren't sure which beer might go best with which burger. Basic burgers include a classic, a Cajun, and a BBQ, while the premium burger section of the menu includes 14 different options, such as a Handyman (two patties, two types of cheese, bacon, mayo, pickles, onion strings, and sourdough bread), a Lumberjack (two patties, two types of cheese, pickles, spices, and Texas toast), a Southern Belle (two types of cheese, pickles, onions, BBQ sauce, and Texas toast), a Havana (a delightful pressed sandwich with two hamburger patties, cheese, pulled pork, ham, and pickles), a Reuben (corned beef, Swiss cheese, sauerkraut, Thousand dressing) and a Mama Mia (mozzarella cheese, sliced pepperoni, and pizza sauce on Italian bread). The meat used for the Abbey burgers is top-quality ground beef, with the 10-ounce patties being juicy and greasy due to their relatively high fat content, which is one of the keys to a tasty burger. Sides include handcut fries and handcut chips (the latter being a good option if you're looking for something less salty). As for beer options, well, they are too numerous to mention here, but they run the gamut from (depending on the season) Sam Smith Nut Brown Ale to Young’s Double Chocolate Stout to Founders All Day IPA to Two Roads No Limits to Cisco Grey Lady to a truly odd but very fine Wells Banana Bread Beer to your basic Bud, Coors, and Michelob. Boston does have its fair share of burger joints, and it also has a number of beer bars, but for some reason, the two rarely seem to be found under the same roof. This is why The Abbey is a must for burger lovers in and around the Greater Boston area--and for that matter Providence itself, along with other sections of Rhode Island and Eastern Massachusetts. Count us as big fans of this terrific little pub that is most definitely off the beaten path. Copyright © 2011-2019, Boston's Hidden Restaurants (www.hiddenboston.com).